Jaguar Land Rover (JLR) has admitted it is unable to stop Chinese carmaker Landwind from producing the new X7 SUV – despite the design being labelled as a "copy and paste" of the Range Rover Evoque. The company has since been exploring the legality of Landwind producing the car, although according to Land Rover CEO Ralph Speth, quoted in the Financial Times, Chinese law prevents JLR from doing anything to stop the X7 being made: “There are no laws to protect us, so we have to take it as it is,” he said. "In Europe we can be protected against this kind of copy-paste in the design language, in the features but also the technology. You can’t be protected in China,” continued Mr. Speth. They say imitation is the highest form of flattery, but JLR will draw no comfort on this occasion because, with the Evoque at the forefront of a Chinese market offensive for JLR, the X7 could seriously scupper its plans. Success in China is imperative for JLR, not least because the company recently invested £1bn in a new production facility in the country, which opened in 2014 as a joint venture with Chinese manufacturer Chery. Around a quarter of JLR’s global sales are to the Chinese market; the company’s decision to open the factory in Changshu, near the south-east coast of China, was partly to avoid vast import taxes incurred by sending British-built cars to the country. But despite that, the Landwind X7 dramatically undercuts the Evoque in China, with the copycat SUV retailing at around £16,000, compared to £40-50,000 for the Evoque proper. 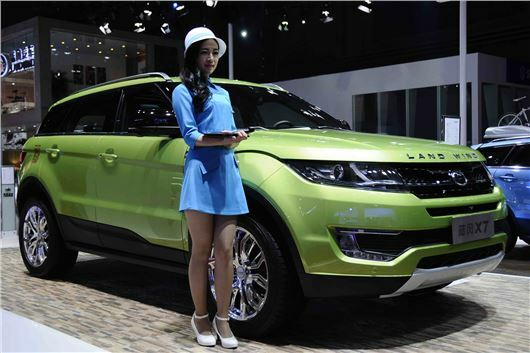 Reports from the Landwind stand at the Shanghai show suggest that the materials, build quality and even the paint of the X7 are notably inferior to those of the Evoque - though that price disparity, and perhaps a sense of patriotism, may persuade some Chinese buyers to opt for the Chinese manufacturer’s product over the Range Rover. However, if the Landwind name was ringing a distant bell as you began to read this story, it could be because the brand gained infamy in 2005 when it was found that its X6 SUV would score zero stars in the Euro NCAP test - it was put through an equivalent test in Germany. Landwind later put the CV9 SUV on sale in Europe, but it was withdrawn after scoring just two stars in the official NCAP test.